Ever have a take home "doggie bag" of great Mexican food, like a whole chile rellano, or a couple of enchiladas? My mind always thinks I can eat all that I order, because it always looks so good... or is it the fact that the food is presented on a platter that could feed all of western Michigan at one feeding? So, I take home a foiled lined dish with more than half of my meal! When it comes time to reheat, I realize I love the side dishes almost as much as the entree. Here is a great Zesty Rice dish. The summer's tomatoes bring this dish color, and the garden's pickled jalapeno and banana peppers put that touch of fire associated with red! If you do not like food that is too spicy, substitute all bell peppers for the jalapeno mix. In pot, in olive oil, over medium heat cook and stir onion and peppers. 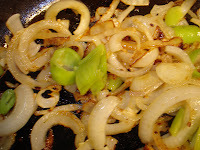 When onions are translucent, add raw rice and heat through. 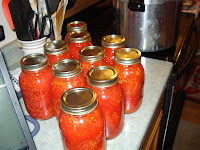 Add tomatoes and heat thoroughly. Add salt, parsley and finally the water. Bring to a boil, place a lid on the pot and turn heat down to low. Without disturbing the lid, allow water to be absorbed. Cook for 30 minutes or until rice kernels are tender. This is like having two restaurant meals for the price of one! Serve with shredded cheddar cheese and a dollop of sour cream if desired - right along side your reheated take home food!